The fifth annual Winter Jewish Music Concert that recently took place at Temple Israel of Greater Miami took the show to another level. This year's version of the annual concert, featuring cantors and other musical performers from both throughout South Florida and out of own, was the best one to date in the five-year history of the concert. "The Winter Jewish Music Concert was a tremendous success attended by over 700 people," Alan Mason, the concert's director, said. powerful performances and spiritual presence that one felt in the room while listening to the music of local cantors, as well as Mason's direction of this sensational spectacle and the tremendous chemistry he had with the performers while accompanying them on piano, this show also had entertaining elements with the beat box duo Bagels ‘n Box, which provided a pleasant experience for the audience and a Jewish dance and magic show by performers Yonina & Miriam which turned out to be a nice experiment for the concert. "We're very humbled to have been selected to share the stage with such an elite group of vocalists and musicians," Bagels 'n Box members Jon Murstein and Jay Stone both jointly stated. of "Hallelujah,” which was a perfect way to culminate the concert and Israeli performance artist Dafna singing "Forever Young" by Bob Dylan. "Music transcends all sorts of boundaries and barriers and this event has been an annual demonstration of that phenomenon," Dafna noted in an email regarding the concert. 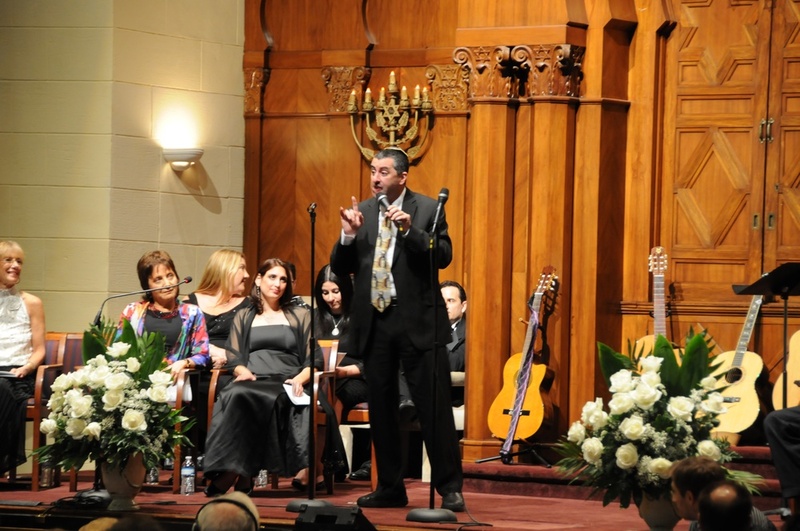 Mason’s goal is to attract an audience simply by presenting Jewish music “performed at the highest level,” and the packed sanctuary at Temple Israel of Greater Miami — which seats about 700 — testified that his strategy works. The program included some eclectic touches, such as a magic show with belly dance, beat-boxed chants, and acoustic guitar folk songs, but by far the bulk of the artists were pure vocalists. Most of them are cantors at South Florida synagogues. Mason explained that he lets the performers sing whatever they want, and the result serves as a sort of talent showcase of excellent singing. The songs embraced a wide range of styles. Most were sung in Hebrew. There were contemporary settings of prayers such “B’rosh Hashana,” “Yismechu,” and “V’Shamru,” and a jazz-inflected “V’ahavta.” There was an art song from the Yiddish cabaret tradition by composer Moshe Milner. There was a Hebrew rendition of the “On My Own,” an aria from Les Miserables (“Levadi”). There was Bob Dylan, and Leonard Cohen. There was Bagels ‘n Box, a witty mash-up of hip-hop beats with cantorial chants. Accompaniment on most songs was ably provided by Alan Mason on piano and Brian Potts on subtle percussion. The audience often joined in on the chorus, and under the sand-colored arches and carved-wood chandeliers of the sanctuary, the whole event offered an inviting, celebratory air. For this reviewer, having spent very little time in synagogues and with zero understanding of Hebrew or Yiddish, a special pleasure was simply dissecting the different vocal styles. The range was considerable. The rough-edged vigor of baritone Erik Contzius was followed immediately by the clear, understated soprano of Shira Silverman Nafshi. The clean cantillation of Aviva Bass preceded the robust vibrato of Michelle Auslander Cohen. I had my own favorites, but the largest ovation (until the closing number) went to tenor David Aaron Katz’s impassioned performance of “V’lirusholayim Ircho,” by New York composer Abraham Ellstein. A two-hour parade of talent runs the risk of getting exhausting, but with such high quality and well-organized staging, it never felt that way. Alejandra Czarny’s moving performance of Leonard Cohen’s song “Hallelujah” that closed the concert brought all the onstage talent together to sing the chorus, and as the crowd rose to their feet and joined in the singing, I couldn’t help but think that a follow up concert was in order with a bit more collaboration between the singers: a few vocal trios or small choirs, or even a small orchestra for accompaniment. I suspect that the logistics of organizing a concert like this are already complicated enough, but it’s a good sign when you leave a concert with this many performers thinking of ways to expand it. Miami will take place for the fifth time this Saturday night in the temple’s Bertha Abbess Sanctuary. It’s an expansive evening of Jewish music and performers, running the gamut from classical to jazz and rap, Ladino and Israeli folk music, and includes works by a wide range of Jewish composers, many of them unfortunately little-known to non-Jewish audiences. The concert is sold out again this year, according to concert organizers, but this year there are other opportunities for interested concertgoers other than being there in person. The 8 p.m. concert will be broadcast live on Jewish Life TV, which is carried on Comcast channel 239 in South Florida and Atlantic Broadband channel 167 in Miami Beach, as well as on DirectTV Channel 366. It also will be streamed live via the station’s website at www.jltv.tv. The concert’s website at www.jewishconcert.orghas a video of brief highlights from last year’s concert, and even in these short snippets there’s a strong feeling of celebration and diversity of expression, as you can see here: www.jewishconcert.org/2012-video. I was reminded of that exchange recently because Alan Mason, one of my friends, is, for the fifth time in as many years, directing what has become an incredibly popular and nationally known Jewish music concert in Miami. Alan’s the program director of the Winter Jewish Music Concert, an annual event that began four years ago as a tribute to him on his 18th anniversary as the director of music at Temple Israel of Greater Miami. Since then, it has grown exponentially in size and popularity. This year’s Winter Jewish Music Concert will be held on Saturday, January 19 at 8 p.m. in the Bertha Abess Sanctuary at Temple Israel. That night, more than 25 singers (cantors, cantorial soloists and musicians) will, accompanied by Alan on the piano, come together from throughout South Florida and beyond to perform a lively mix of tap-your-foot, sing-along Jewish music, including liturgical, pop, jazz, folk, Israeli, Yiddish, Ladino, cantorial, beat box, magic and illusion, as well as other styles. A capacity crowd of more than 700 will, as in the past, pack the sanctuary, while countless others will watch the first-ever live broadcast of the concert on Jewish Life TV. Although I’ve never made it to Miami for the concert (or for any other reason, in fact), I’ve seen video clips from previous concerts and I can tell you that you and I would love a pair of seats in the sanctuary. In an ideal world, we’d take a mid-winter, leave-it-all-behind mother-daughter jaunt to Miami to fill those seats. Of course, this isn’t an ideal world and the best I can do this year is tune in to Jewish Life TV next Saturday night to watch and listen virtually. I’m not sure what kind of electronics set-up you’ve got in your yeshivah shel mal'ah (or, come to think of it, if, given where you are, you even need video equipment to see and hear the concert! ), but I hope you, too, will tune in—in whatever way works best—to hear the music and feel the enthusiasm. You will love it! If you need more information, there’s lots of it here on the concert’s website. As always, I miss you lots and wish you were here. Enjoy the music, The Mums. Cantors and soloists throughout South Florida synagogues collaborated for a concert to celebrate Alan Mason's 18 years as Temple Israel of Greater Miami's music director four years ago. This concert drew a capacity audience of more than 700 people and its success inspired Mason to make it an annual one. This year's version of the Winter Jewish Music Concert takes place at 8 p.m. on Jan. 19 at Temple Israel's Bertha Abess Sanctuary, 137 N.E. 19 St. in Miami. The program will feature approximately 25 musical artists, including singers and Mason, the program's director, as the pianist accompanying them, who will perform Jewish-inspired music that's not limited to the synagogue. They will perform a diverse range of music such as Ladino, Israeli, folk, Yiddish, pop, classical, hazzanut, jazz, rap and tango and beat box. The concert is becoming a nationally known one and for the first time this year, will broadcast live nationwide on Jewish Life TV. "This [live national television broadcast] is going to increase the global visibility of the program and there is a kind of exciting adrenaline and nervous energy among the performers knowing that the viewing audience has just been increased tremendously," Mason said. Mason added, "Our intent at this point is to continue to build the live audience, 700 plus people, who enjoy the evening sitting at the sanctuary and our goal at this point is to maintain that audience density and impress upon people that it's a very diverse program and a very fun, enjoyable evening." Susan Shane Linder, a guitarist from Congregation B'nai Israel in Boca Raton who will perform at the concert for the fourth time, said the event is "an amazing and inspiring atmosphere." Natalie Young of Ramat Shalom Congregation in Plantation, another concert veteran, added "It's incredible to get to perform with friends and colleagues and it's great to hear the wealth of Jewish music elsewhere." First-time performer Aviva Bass, a cantorial soloist from Temple Beth Orr in Coral Springs, said, "I'm honored and excited to perform in one of the largest and most respected Jewish music concerts in the country." The concert also features Israeli performer Dafna, who said it's a tremendous honor to perform at the concert. "The array of talented performers reflects the vibrancy and diversity of South Florida and its overall community," she added. Members of the beat-box duo Bagels 'n Box, Jon Murstein and Jay Stone, both issued a joint email response regarding their excitement to being invited to perform in the concert. "We're very humbled to have been selected to share the stage with such an elite group of vocalists and musicians," they noted. "We're ecstatic for what promises to be an unforgettable evening of Jewish music." Tickets are $18 for general admission. The event this year includes a pre-concert food reception from 6-8 p.m. catered by Gigi and admission for both the concert and reception is $36. Mason recommends purchasing tickets immediately and to get to your seat on time because the concert will start immediately at 8 p.m. due to the live television broadcast. For more information and to purchase tickets, visit http://www.jewishconcert.org or call 1-800-838-3006. The broadcast will also stream live athttp://www.jltv.tv.